The producer of Army of Two: 40th Day said that Infinity Ward pushed the boundaries with the airport scene in MW2 and that he "wouldn't have done it." 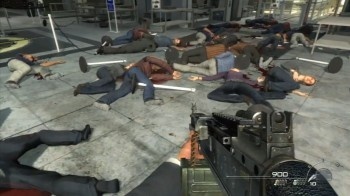 Matt Turner, writer and producer of the forthcoming Army of Two: 40th Day, told Computer and Videogames that the makers of Modern Warfare 2 went too far with the notorious scene, but that's ultimately a good thing. He goes on to give respect to Infinity Ward with a "hat's off." Army of Two: The 40th Day will be released on January 13th, 2010. "You're playing a CIA agent, it's designed to show the atrocities... it's pretty awful and if you fail to see that side of it than you're not getting the whole picture," Turner said. "That being said, I thought it took it a little far; it was pretty out there. But I like seeing that they have guts like that." I say maybe they pushed it too far but in a way that's a good thing because the media of videogames is very young. We have to start pushing limits, making statements and seeing what kind of social and cultural relevance that we can have which hasn't really been nailed yet. I think [Infinity Ward] were pushing towards that direction and trying to make people experience something truly terrible. Whether they were successful or not I'll leave up to the players to decide, but I liked the fact that they were trying something new that people haven't done before. I think that's really gutsy and my hat's off to Infinity Ward for trying at least. It's interesting to hear one developer directly comment on another's work. MW2 has polarized our culture, and that is also true of game designers. The lasting effect of the airport scene remains to be seen. Will we see other developers try to emulate experiencing such atrocities from the point of view of a terrorist?